Your website hosting includes use of our ezNetPublish content editor which allows you to easily make website edits using a simple process and without needing to be a programmer. This guide will show you how you can make changes to your website copy, change or add photos and add links on your pages. Begin by visiting your website. Enter the User Name and Password you were provided at training. Note: Always keep this stored in a secure but easy to access place. You will notice the look of the pages is the same but now has additional links. 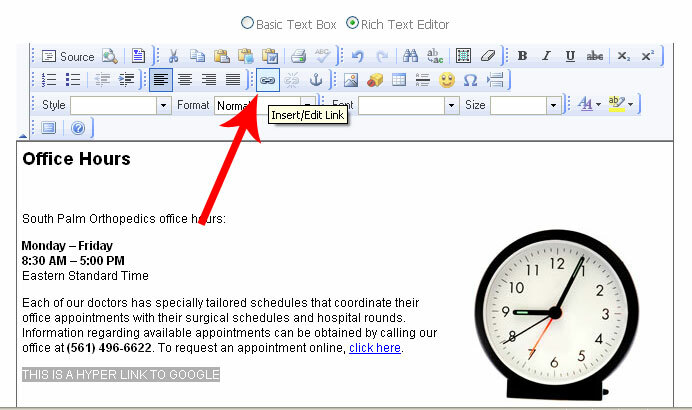 Navigate to the page where you want to make a change and click on “Edit Text”. Login with your admin username and password. You will now be in the Admin area of your site. 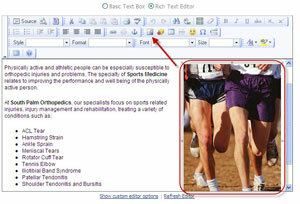 To make changes to copy, click on “Edit Text” for the section you want to edit. 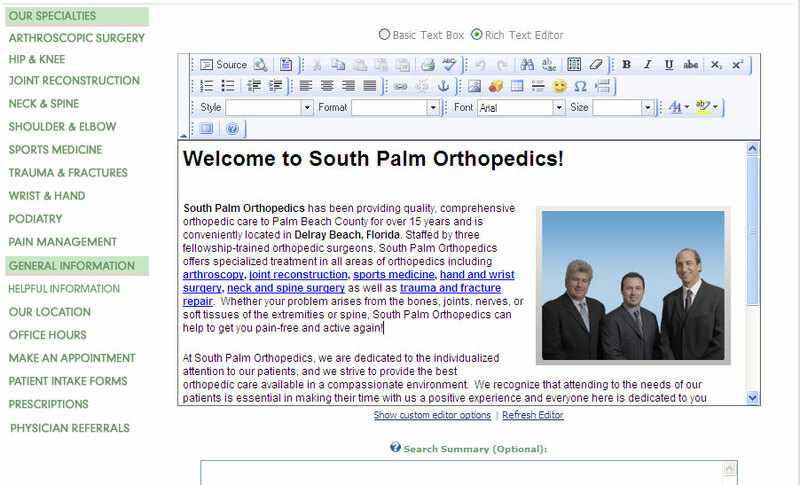 This should take you to “Text Editor” and you will notice on the next screen an interface similar to Microsoft Word. 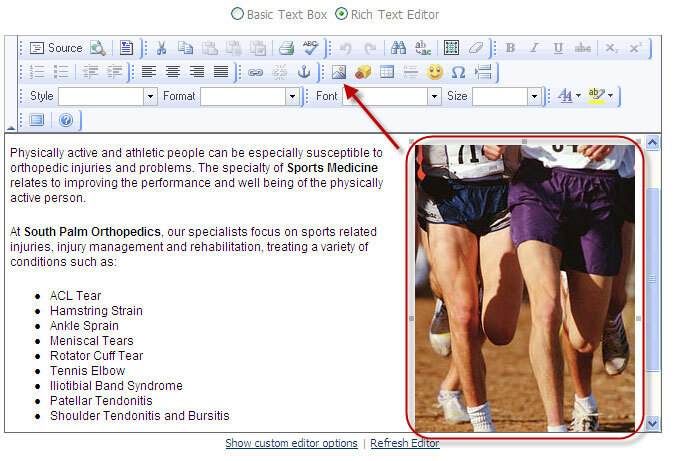 Position your cursor where you want to start and type in your copy. When complete click on the “Update” link at the bottom of the page. You MUST complete this step to save and publish your changes. 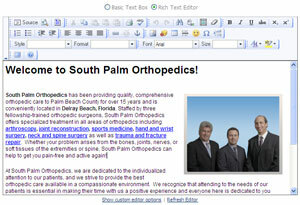 In the Text Editor, type in your text and highlight it. 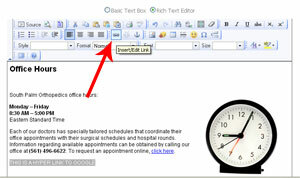 Click on the “Insert/Edit Link” button found in the tool bar. A Link pop up window will appear. Type in your URL i.e. www.google.com and click on OK.
Now the page you are adding the link to will re-display. Scroll down to bottom of the page and click on Update to save and publish the page with your Hyperlink. You MUST complete this step for your changes to be saved and published. Continue updating your copy, scroll down to bottom of the page and click on Update. Do this for all pages you wish to edit. 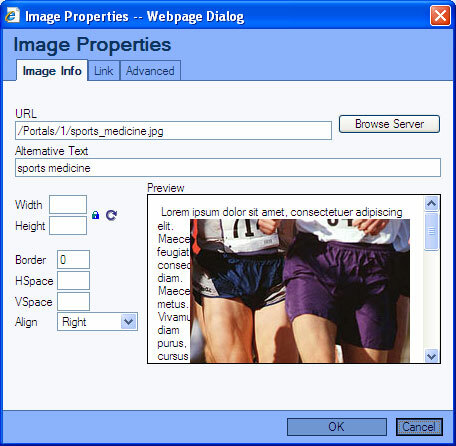 To Insert/Edit images within the content, click on “Edit Text”. This will take you to “Text Editor”. Select the image then click on insert/edit image button from the tool bar, which will take you to the Image Properties. Click on Browse Server to see all the images on the server for your site. From this Image Gallery you can pick an image or upload a new image. To upload a new image not found on the server, click on “Browse” which will take to your local computer’s hard drive (Usually to My Pictures) to Choose a new image. Select and image and click on Open. Now click on “Upload new File” to load selected image in to the Image Gallery. Once in the gallery, click on the new image to load in to the page. Once you have updated your image, scroll down to bottom of the page and click on Update to save and publish the page with your new image. Note: Make sure you have updated your changes!